It has been a couple of tough days. 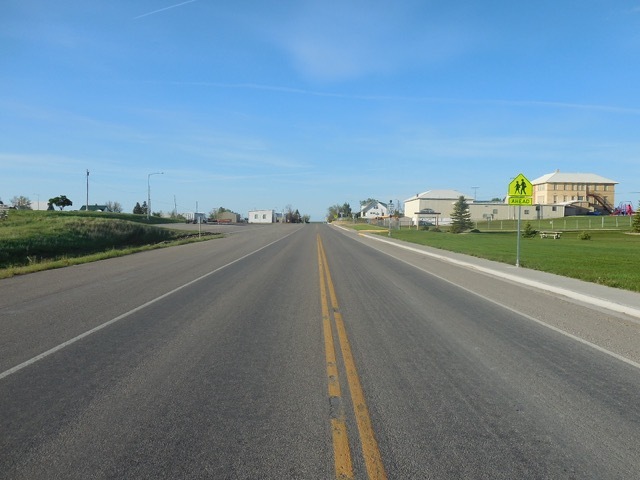 Lots of truck traffic, some sections of road with no shoulders, or let me say it this way, the white line was the shoulder. HOT! It was 95 today and I struggled getting the last 7 miles in. And to top it off for the last few days and nights I have not had any internet service (WIFI) to help with the Blog. I’m now in Roundup, MT and will be here for tomm also. Am taking a rest day tomm.. This will give me some time to catch up on the travel notes. I have some tough days left just to get out of Montana. Thanks for all who have called me and or dropped me an email or text message. To my FB fans thanks also. I want to make it as much fun for you as it has been for me. Let me do the sweaty work though. 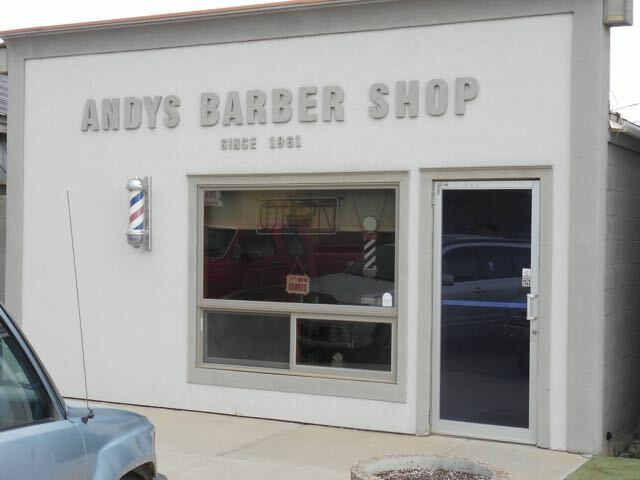 When I left Ben’s home in Geraldine, Ben reminded me to make sure and stop at Andy’s Barber shop in Sanford to meet Andy. So as I pulled in Stanford I drove down main street to look for the barber shop. 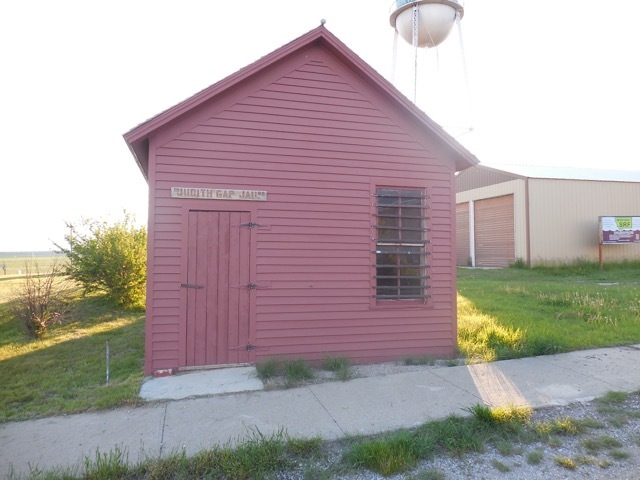 It is not hard to find a barber pole in a small town in central Montana. Look for all flatbed pickups with cow dogs standing in the back of them barking at the next truck 4 feet away. You know I walked in the barber shop and Andy is cutting a fellows hair. It is like we have known each other all of our lives. I ask Andy if it is ok to camp in the city park and he says why do that when I can stay at his home and have supper and use of his shower. Momma didn’t raise no dummy here. 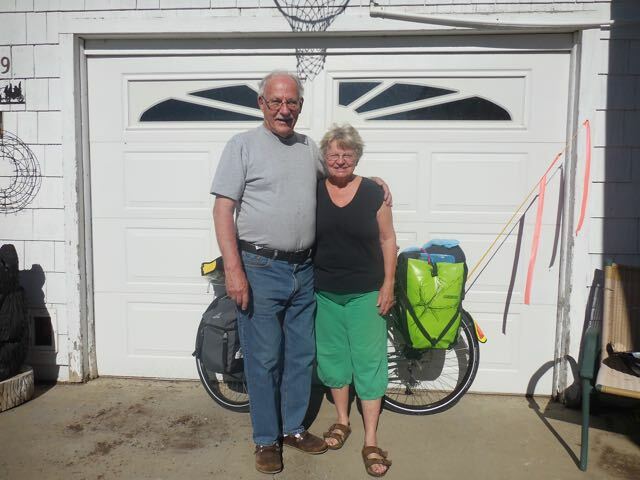 To make a long story short, I spent a great evening with Andy and his wife Alverta sharing stories of local and world. They have a beautiful home. And too open it up to a complete stranger. Turns out we know many of the same peeps. This is what you call Podunk bingo. Here is pic of Andy and Alverta on my way out of Stanford. Andy and Alverta are my heros on the Day. After leaving Stanford the plan was to head over to Eddies’s Corner and south to Judith Gap, Mt. Easy ride for the most part. Exception being that at times the white line was also the shoulder of the road. Just didn’t have a problem getting to Judith Gap. Of course not having a place to stay it was off to the city park to set up the tent and then to do just a little exploring of the city. Quiet little town for the most part. There is a train track that goes through the west side of the city and the train did blow its horn a couple of times that night. Night was cool for sleeping and the dew point was low as everything was covered with dew in the morning. Not an exciting journey this day. If you act up, you spend some time here. I guess there was a special moment on my stay at Judith Gap. I’m a poor sleeper. I’m laying in my freezing tent and way in the back ground I hear this screaming 2 cycle motorcycle getting closer and closer. What seems like 10 minutes, actually maybe 9, this motorcycle is in town and proceeds to rip the neihborhoods with his mufflerless crotch rocket. Now he is not looking for anyone, just saying hi at 3 in the morning. Surprised I didn’t hear a gun shot actually from a homeowner. But maybe I’m the youngest in town that night with good hearing. Well after ripping the village he proceeds to the pay by credit card gas pumps at the local co-op. I think anyway. As the cycle is turned off for about 15 minutes. Well I hear it start up again and then you know that sound, the sound of squealing rubber and nothing really going anywhere. I’m sure I could smell burning rubber from my tent a block away. And then he left to village heading north. Only to let us hear him for another 9 minutes. I did swing by the gas station in the morning and was not disappointed by black rubber donuts in the middle of the highway. Happy cowboy you suppose. For me, a few more hours of sleep. I actually beat the chickens out of bed.